“Mom, can I play that math game?” These words are a frequent refrain around my house these days, and they’re music to my ears. 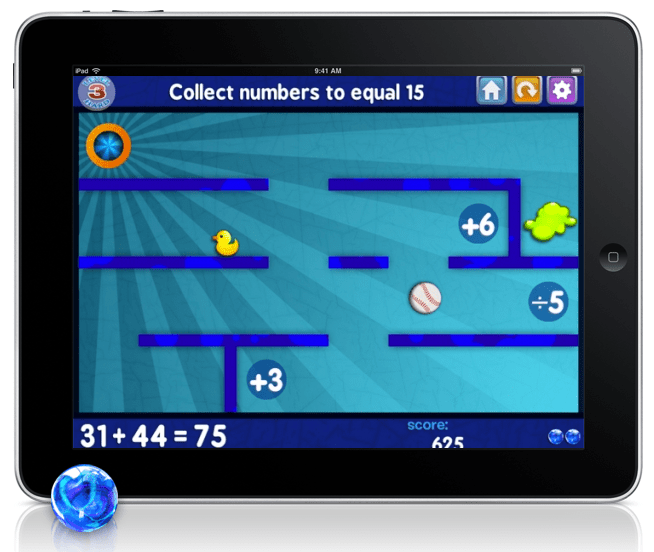 Here’s a look at four great math apps my kids are not just enjoying, they’re begging to play. Numbers 1 and 2: Artgig Studio‘s Marble Math apps for iOS are so good they score two spots on my list: one for Marble Math and one for Marble Math Junior . Kids drag a marble around the screen (there’s a tilt-the-screen option too) to hit the right answers and fun bonus items. Both versions of this app have been an enormous hit with my kids ages three through 11. The three-year-old needs help from me or an older sibling to identify odd and even numbers, count by fives and tens, or work the simple addition problems in Marble Math Junior ; the six- and eight-year-olds can play it independently, picking up some excellent math-fact drill quite unawares. The older kids’ app presents more challenging problems but delivers the same absorbing, addictive game action. These apps get my highest recommendation. Number 3: Mathris by Divmob. Like Tetris , but with math facts. Simple and brilliant. Instead of stacking pieces of different shapes, this clever Tetris variant has the player stacking blocks with matching answers. For example, in the multiplication section, a 6×8 block stacks with a 4×12 block — and, of course, a simple 48 block. As a homeschooling mom, I love how much fun Mathris infuses into math-fact practice. And I have to admit: the first time I tested it on my Kindle Fire, I found myself playing well into the night. You know how once you start a Tetris jag, you can’t stop? Yeah, this game is even more so. Available for iPad, Android devices, and Kindle Fire. Number 4: Lola’s Math Train by Beiz. This appealing app, available in iOS, Android, and Kindle Fire versions, is aimed at kids ages 3-7 and focuses on simple math concepts: counting, sorting, addition, and subtraction. Lola the Panda takes her animal friends on a train ride, stopping along the way to solve problems. It’s a gentle introduction to number sentences, sequencing, and basic arithmetic. Did I mention it involves a train? Yeah, with that hook you’ve pretty much got my little ones at hello. “I really like math,” my six-year-old announced, dragging a 2-balloon and a 4-balloon into an equation to match the 6 on the other side. I’m glad to see her climb on board that particular train.